Nintendo's logo, which dates back tae the 1980s. The current colour wis adoptit in 2006. 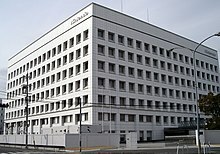 Nintendo Co., Ltd. (任天堂株式会社, Nintendō Kabushiki gaisha) is a Japanese multinaitional consumer electronics company heidquartert in Kyoto, Japan. Nintendo haes released mony gam systems, anaw th' nes (nintendo entertainment system), gameboy, snes (super nintendo entertainment system), virtual laddie, 'n' th' nintendo 64. ↑ "Company History" (in Japanese). Nintendo. Retrieved 2006-07-29. ↑ 4.0 4.1 "Consolidated Sales Transition by Region" (PDF). Nintendo. 2014-05-07. Retrieved 2014-05-25. ↑ 5.0 5.1 "Consolidated Sales Transition by Region" (PDF). Nintendo. 2013-04-27. Retrieved 2014-05-25. ↑ "Consolidated Financial Statements" (PDF). Retrieved 27 April 2016. This page wis last eeditit on 19 Dizember 2017, at 17:03.